Are you looking for the perfect hairdo for this New Year’s Eve? Do you want to impress all of your friends with your unique appearance? If your answer to either one of these two questions is yes, do not hesitate to keep on reading this article. In the paragraphs below, you will find the top hairdos that you can choose for this New Year’s Eve, allowing you to look exactly as Hollywood celebrities. Once you know for certain which hairdo you prefer, you can move on the preferred makeup, clothing and accessories. The elegant bun is one of the most classic choices for this New Year’s Eve and one that will certainly create a pleasant impression. Begin by applying gel (lightweight) to your damp hair and then organize it in a high ponytail. Once you have achieved all that, it is time to divide your hair into two sections and then twist them together, until you obtain your elegant bun. In order to keep everything in place, it is recommended to use a lot of bobby pins. For such a hairdo, it is for the best to choose large jewelry and simple makeup, in order to maintain an overall elegant appearance. The wavy hairdo is easy to arrange and it will help you look exactly as a princess (especially if you will pair it up with an elegant tiara). After dyeing your hair in the desired color, it is time to take your volumizing mousse and work your magic. It is recommended to blow dry your hair, applying the mousse throughout the entire process. Then, while your hair is slightly damp, use your curling iron and began creating those beautiful waves. As it was already mentioned, if you want to look even more beautiful, you can wear an elegant tiara and glam earrings. If you have always loved the 1970s, it is high time you tried a hairdo that reminds us of that period. For the first step, it is recommended to apply pomade to your hair, in order to ensure it will stay in place. Then, choose a ribbon, in a color that you prefer. 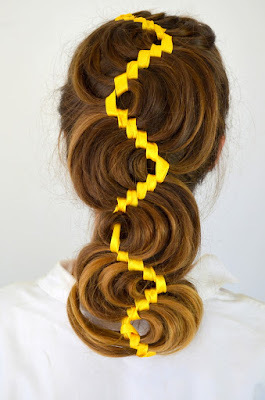 Begin by wrapping it, as if it was a headband, then braid your hair, implementing the ribbon into, as you go along. The ribbon can match the color of your outfit or the one of your accessories. This type of hairdo works great with beaded jewelry, so do not hesitate to go for this combination and be the envy of all your friends on New Year’s Eve. Mega curls represent the perfect choice for New Year’s Eve. It is recommended to wash your hair the night before, blowing it dry, until it is slightly damp. Then, take your large twists and apply them to individual strands of hair. If you want for your hair to shine the next day, you can apply several oil sprays in the end. In the morning, arrange your curls and continue your preparations for the final day of the year. You can also take vitamins for hair growth, but it is advisable to begin taking those with at least one month before, in order for them to act at the level of the hair. The 1940s brought unique hairdos to the world, with women exploring their beauty and sensuality to the maximum. This hairdo can represent the perfect choice for New Year’s Eve, especially if you will pair it up with a polka dot dress and vintage accessories. You can begin by curling several strands of hair and bringing them up into small buns, on each side. Keep them in place with bobby pins, then straighten the rest of the hair. This hairdo is incredibly beautiful and it does not take more than a couple of minutes to create. Elegant, minimal accessories work the best; as for the makeup, stick to the black eyeliner and red lipstick. Be a 1940s girl and everyone will love you for it. These are only a couple of suggestions when it comes to top hairdos you can try out this New Year’s Eve. Keep in mind that it is not sufficient to have an amazing hairdo; you must also pay attention to the clothes, shoes and accessories you are going to wear. Do not hesitate to search for inspiration in the style of Hollywood celebrities; these are the ones that establish current fashion, makeup and hair style trends. It is also advisable to take really good care of your hair, using natural masks, such as the ones made with extra virgin olive oil and avocado. Once your hair is healthy and strong, your hairdo will look even better! Meighan Sembrano is an enthusiast and passionate writer. She is a contributor to Consumer Health Digest.She is expertise in Beautyand skin care articles.Also, have contributed in the health and fitness field. Her work gives an enthusiast twist to the readers. She resonates the readers with her simple and thoughtful words.